11x17 Mobile Storage Cart - GS Direct, Inc. 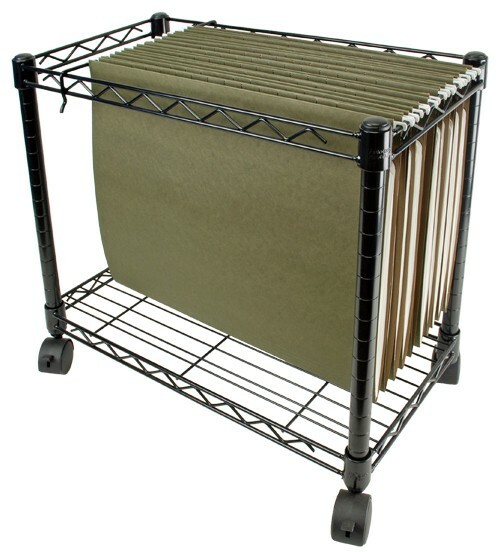 This versatile wire frame cart is perfect for storing and moving your 11" x 17" documents anywhere you need them. Features adjustable rod for the hanging file folders (optional), plus room to store binders your your 3-ring vertically. RFC-10 Cart dimensions: 23 ½” L x 12 ½” W x 20 ½” H. Optional folder (5038) dimensions: 14" H x 18" W.
Shown with optional 5038 hanging file folders.